The latest addition to the Village brand, Village Hotel Katong, as its name suggests, brings with it the Nonya flavors of Singapore s Eastern regions of Katong and Marine Parade. This non-smoking 229-room hotel, which features Superior, Deluxe and Club categories, provides great value for travellers. Village Hotel at Katong draws its inspiration from the Peranakan heritage of its surrounding, which can be reflected in the hotel s Straits Chinese design accents. 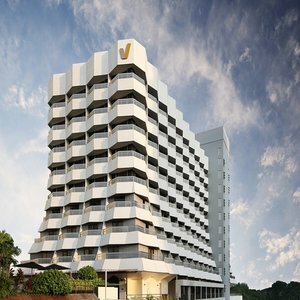 Village Hotel Katong is one of the few hotels which are located near Changi International Airport, and is just opposite Parkway Parade, one of the biggest shopping centres in the East of Singapore. Village Hotel Katong by Far East Hospitality is situated in the Katong precinct, a residential area in the East of Singapore brimming with Peranakan (Straits Chinese) culture. The Peranakan-themed hotel is seated on the new Katong V Mall, guests have easy access to an array of dining and retail options. The popular Parkway Parade and I12 Katong malls are also just 5 minutes away by foot. Village Hotel Katong features 229 rooms styled in warm, vibrant colours and furnished with Peranakan decor. The rooms will please leisure travellers, while also wired to suit business guests, with complimentary wired broadband Internet, Wi-Fi access and a 46-inch LED TV with ports for electronic devices. The rooms come with coffee/tea making facilities, an accessible balcony, rain showers in the bathrooms and a full range of amenities. Open for all-day dining, the Coffee House serves Asian and international dishes, as well as American buffet breakfast. Katong Kitchen on level 4 serves delicacies made famous in the Katong precinct, and cocktails are available at the lobby lounge.